CProgrammingCode.com is a programming blog where you learn how to code and data structure through our tutorials. 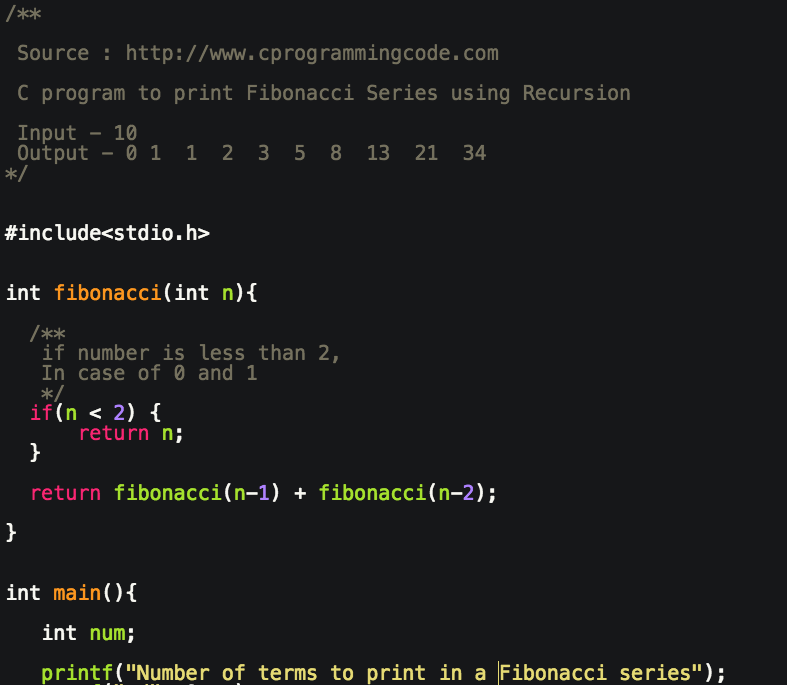 Write a c program to print Fibonacci Series using recursion. Given a positive integer n, we have to write a c code to print fibonacci series using recursion. This question is also very important in terms of technical interviews. In my last post, I have already discussed C program to print fibonacci series using while, do while & for loop. Let's first understand, what is Fibonacci series? In Fibonacci series, first two numbers are 0 and 1, and the remaining numbers are the sum of previous two numbers. You can clearly see first two numbers are 0 and 1 and the rest of the numbers are the sum of previous two numbers. In this post, We will learn how to print Fibonacci series using recursion. So let's understand what is recursion. In simple words, Recursive function is a function that calls itself. Through recursion, We can write much cleaner and shorter code for complex problems. In recursion program, Always specify the base condition(terminating condition) otherwise code will run infinitely until the program run out of memory. In this program, we take a number of elements to print in a fibonacci series as an input from user. Then our recursive method print fibonacci series upto that number. Another way to write this program using recursion.